With the valuable assistance of skilled team of professionals, we are engaged in offering an extensive range of high-quality Industrial Calorifier. 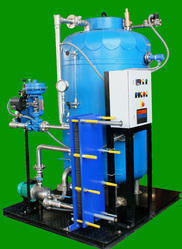 For hot water storage calorifiers with removable u-tubebatteries for production and storage of Domestic Hot Water. Soft polyurethane foam lagging and PVC coating.